What’s the best way to create the healthiest home environment possible? Having a clean home – sans chemical cleaning agents – is super important. Plus, opting for making your own eco cleaning solutions will save you some major moolah (like $500/year!)! Using eco-friendly cleaners are better for your health. Babies are especially vulnerable to chemical exposure, and they happen to put almost everything in their mouth while crawling everywhere. This means it’s super important to keep your house clean with supplies that won’t lead to health problems – like asthma, allergies, and even cancer. Some of the cleaning products even marked “natural” are not! No one regulates the claims made on those labels so you have to do your research! The EPA has determined that infants up to age 2 are, on average, 10 times more vulnerable to carcinogenic chemicals than adults. Before the age of 2 babies have accumulated 50% of their life-time cancer risk. Maternal exposure to toxic chemicals can be extremely dangerous to the fetus. It makes me so happy knowing I’m set up to clean green and don’t have to worry about the safety of my babies on the ground. 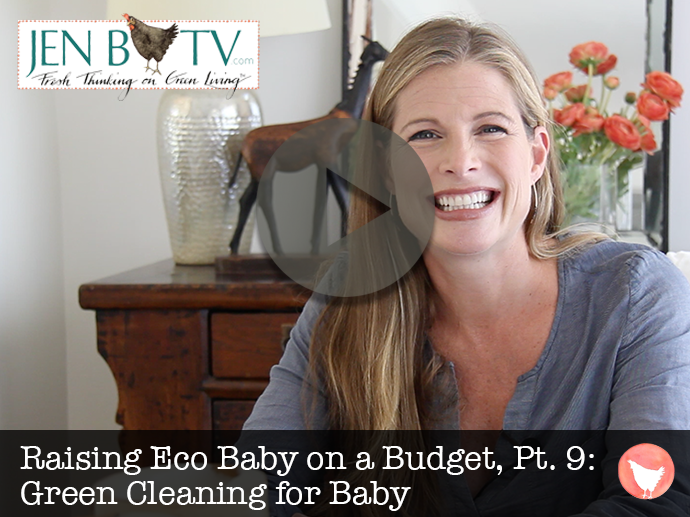 Watch the episode for my tips on picking the best (and truly) eco cleaners AND how you can make your own! For the cleaning solutions you do decide to buy, check the Environmental Working Group’s (EWG) database for truly “eco” options. Cleansing is popular for the bod, but what about for the home? Check out this manageable 3 step process to give your home a cleansing. This product from Branch Basics changed my whole green cleaning life. It’s 1000% worth the “not sold on Amazon” hassle. There are 3,163 chemicals allowed to be described by the single word “Fragrance?” So if you decide to research your own products, definitely remember that, and also avoid cleaning products that contain triclosan, chlorine, ammonia, and phthalates.